Small "owner operated" company. who takes "PRIDE" in their work. We take our time and do an EXCELLENT job. Keeping our eye on the little things which makes the difference between a good job and a great job. In fact. we do such a professional. eye perfect job. that I GUARANTEE IT FOR ONE FULL YEAR!!! I'll even put it in writing! No other painter will do that. I personally do the work myself with a helper. the old fashioned way and do not send a crew to do it for me. Assuring you of outstanding results. If you do it right the first time. it will last for years to come. NO HIDDEN charges!! NO GAMES!! I will come over and give you a free estimate and then "STICK" by it. I will work with you to fit your budget. We can handle it all. Wall repair. spackle/plaster. skim coating. old flaking. cracked or peeling paint removed. cracks/blisters on walls repaired. stains killed. water damage repaired. Sheetrock repaired. wall paper removal. ceiling borders. trim. split colors. accent walls etc. Premium Benjamin Moore paint used. (or your choice of brand) Neat and clean while working. You'll find no sloppy jobs here. We DO NOT get paint on ANYTHING. except the walls. ceiling. doors and trim. Bonded. 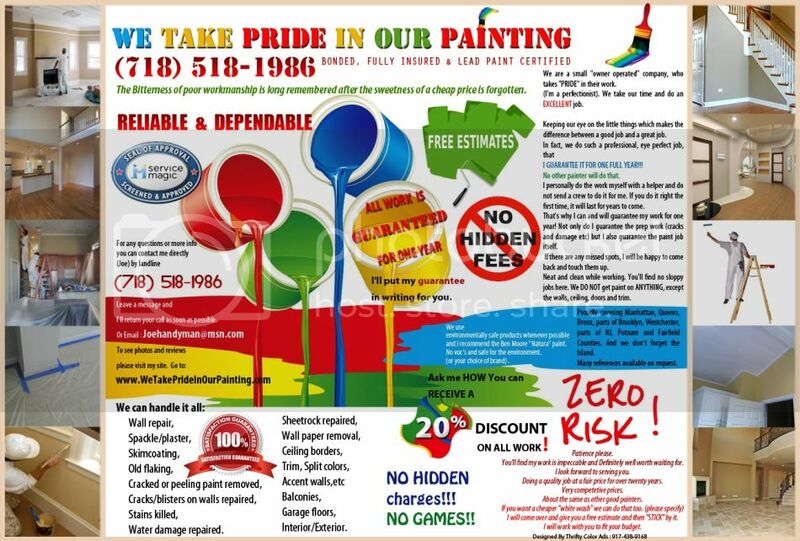 FULLY INSURED and LEAD PAINT CERTIFIED. We use environmentally safe products whenever possible and I recommend the Ben Moore "Natura" and super spec paints. No voc's and safe for the environment. If you need help with colors. I have both Benjamin Moore color sample books. They have every color they make. I will help go over color schemes with you. Covering Manhattan. Queens. Bronx. Westchester. Fairfield. Putnam Counties. And we don't forget the Island. AS STATED. ALL WORK IS GUARANTEED FOR A FULL YEAR. ASK ME HOW TO RECEIVE A 20% DISCOUNT ON ALL WORK! Leave a message and I'll return your call as soon as possible. You'll find my work is impeccable and Definitely well worth waiting for.